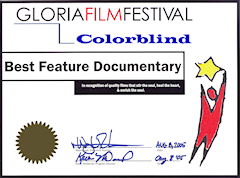 Pamela Peak’s first documentary film, Colorblind, appeared in 20 film festivals around the U.S. and won 4 Best Documentary awards. 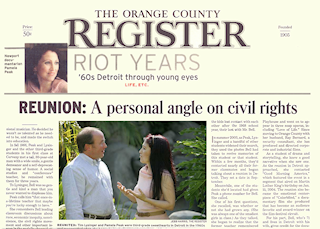 The film profoundly touched hearts and minds as it rapidly swept across the nation. 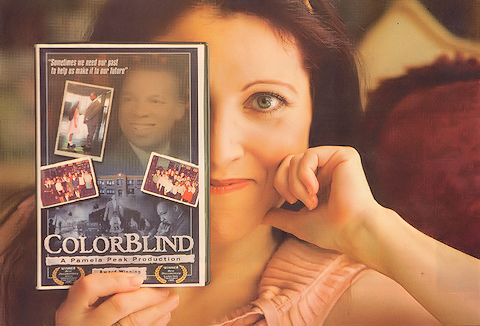 Broadcast to over 56 million PBS viewers, Colorblind was seen on PBS Television in the U.S. and Canada . 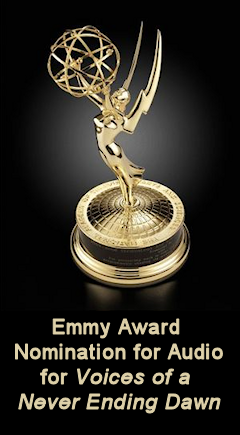 . . where the film continues to be aired by select PBS stations every year. The 6-minute video below shows the exciting path Colorblind took, and provides a glimpse of the kind of press Pamela Peak generated to spread it’s positive message. 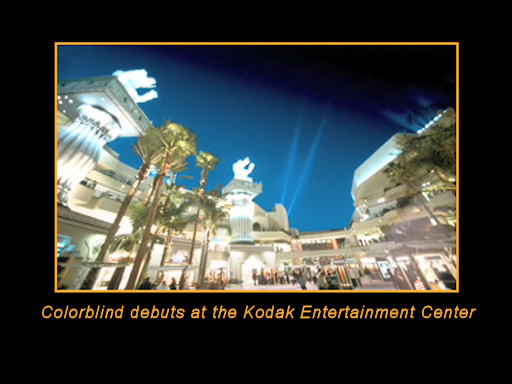 The video was first shown in a celebration brunch in the very ballroom where, one year earlier, the original class reunion took place that aired on Good Morning America and inspired the Colorblind film project. 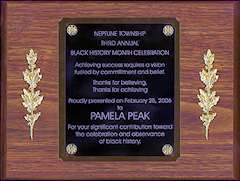 Pamela's adept marketing skills helped the film screenings (both in festivals and on PBS) to appear in countless major newspapers across the country. 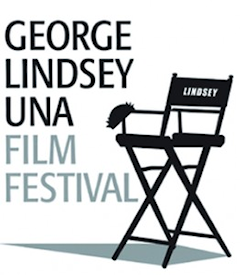 The film first aired on PBS in 2008 and still airs on PBS stations today. It has become a favorite with PBS Program Directors and it has inspired and meant so much to teachers across the nation who have watched the film. Teachers also use the film and its accompanying Study Guide with their students. That Study Guide helps young students of today understand the period of the 1960s from a child's viewpoint of growing up in such a turbulent time. The film also inspires young teachers when they see how one single teacher can inspire so may students, so profoundly. 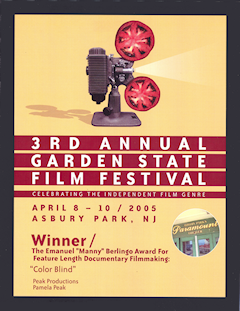 In early 2007 in a large press event, Producer/Director Pamela Peak returned to the original ballroom to hold "The Colorblind Celebration Brunch". It was an event filled with excitement in the packed ballroom as Pamela, her co-producer Timmy Lysinger and the Executives of Detroit Public Television announced the classmates that their story – the story of Mr. Bell and Colorblind – would soon appear on PBS stations nationally. 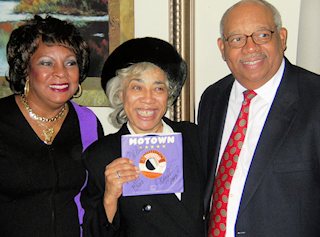 Motown Star Martha Reeves was on hand to honor Detroit Public School Teacher Mr. Bell (the great teacher who is the subject of Colorblind). But what Martha Reeves didn't know is she, too, was going to be honored at this press event. A special presentation highlighted her great contributions to the Civil Rights Movement and race relations as a young Motown singer, when she traveled the country with her fellow Motown Stars letting their music become a "bridge of humanity" across the racial divide of the nation. 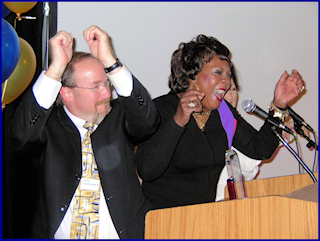 Little did Mrs. Bell know that Martha Reeves—Mrs. Bell's all-time favorite singer—would perform "Dancing in the Streets" to a jumping crowd (see photo above), and then present Mrs. Bell with an autographed copy of her "Dancing in the Streets" record! Visit the Colobrlind website to experience some of the moving moments of: The Colorblind Celebration Brunch Video Clips. After the roaring success of Colorblind , Pamela's second documentary film, Voices of a Never Ending Dawn, went straight to distribution to PBS television stations across the U.S. Action-packed reenactment scenes combined with the words of the soldiers and their families, created a moving film that also swept across the U.S. and Canada. 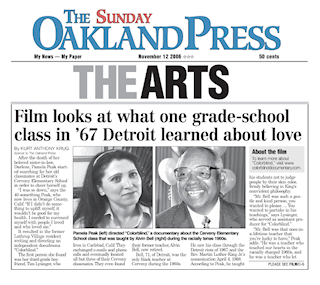 Front-page press accompanied the film across the country. The Kansas City Star featured a photo (below) of Polar Bear soldier descendant Charles Ray and his son, attending the screening at the National World War I Museum at Liberty Memorial in Kansas City. Missouri. 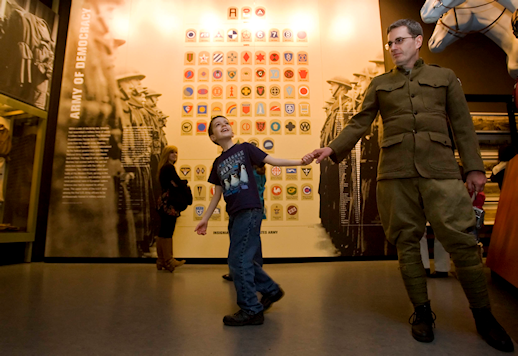 The elder Ray wore a replica of the uniform his grandfather wore while fighting in northern Russia during World War I. Press coverage in other cities also included dramatic photos like the one below of Actor Alex Alexandrou portraying Sgt. Silver K. Parrish manning a machine gun post, in one of the film's many reenactment scenes. Composer, sound designer and recording engineer Rick Sherman, seen in his sound studio in the picture below, was nominated for a Michigan Emmy Award for Audio for his work on Voices of a Never Ending Dawn. 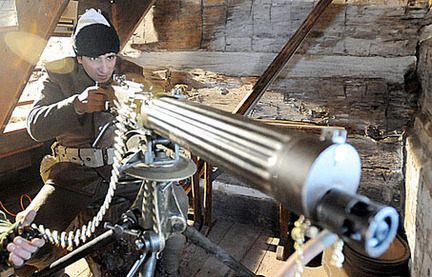 Risk artistically blended Authentic World War 1 gun and cannon fire with the film's moving music to produce a captivating yet realistic sound track for the movie. "The authenticity of the film's reenactment scenes was important to us", said Pamela Peak, "and we needed authentic sounds as well as military uniforms and visuals. The story is told in the words of the soldiers and their families. Every film element had to be true to the story." 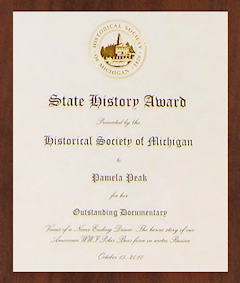 The Historical Society of Michigan bestowed on Pamela Peak the State History Award for Media in recognition of the contribution of "Voices of a Never Ending Dawn" to documenting Michigan's history. Five thousand Michigan families contributed their sons and fathers to the little-known American North Russian Expeditionary Force, who were all but forgotten and left in Russia at the end of the war, until their families ceaselessly petitioned Washington for their return home. These brave men were promised that their sacrifices in the 60-degree-below-zero Russian weather would not be forgotten, a promise fulfilled by the production and release of Voices of a Never Ending Dawn.